The Syrian army launched a counter-strike against rebels in the north on Sunday, in a bid to wrest back control of positions lost in recent days, a monitoring group said. In the northwestern province of Idlib, much of which is now in rebel hands, the army used fighter jets to bombard Maaret al-Numan, captured by the Free Syrian Army earlier this week, said the Syrian Observatory for Human Rights. To the east of Maaret al-Numan, troops tried to block a new rebel assault on the Wadi Deif army base -- the largest in Idlib province -- where large quantities of fuel and tanks are stored. Battles broke out in Maarshurin and Hish, near the base, while fighter jets bombarded the area, the Britain-based Observatory said. Last week rebels reportedly captured 256 soldiers in fighting near the Turkish border. The rebel FSA has been building for months its presence in Idlib and neighbouring Aleppo, where fighting has raged since mid-July. The ill-equipped rebel fighters have destroyed in recent week several military positions in the Idlib province and seized weapons. "The importance of these operations lie in the weapons which the fighters seize during the attacks," the head of the Observatory, Rami Abdel Rahman, said. The army has been hitting back from the air but analysts now say that the regime's aerial supremacy is no longer a decisive factor in the fighting, as the opening of multiple fronts countrywide stretches its capabilities thin. Also on Sunday troops withdrew from a military checkpoint near the rebel-held town of Saraqeb, which is now fully in rebel hands. At least four rebel fighters were killed in violence in Idlib, according to the Observatory. In the Aleppo countryside, three rebel fighters were killed in clashes with troops near the so-called Base 46, scene of battles since late September. Syria's state news agency SANA reported, meanwhile, that troops killed and captured "dozens of terrorists and destroyed anti-tank rockets" in Aleppo. Elsewhere, two explosions hit the upscale district of Mazzeh in the capital Damascus in the early hours of Sunday, the Observatory said, adding that one of them targeted the car of a pro-regime lawyer who was critically injured. SANA said the other blast was a "suicide attack" that caused no casualties. 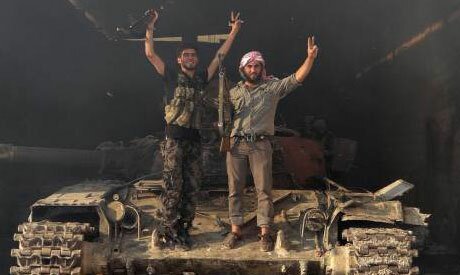 In Damascus province, regime forces took back control of a military base in Atibah, a day after rebels had seized it. At least 18 people were killed nationwide on Sunday, the Observatory said, in addition to more than 33,000 who have died since the revolt against the regime erupted in March last year. Al Ahram keeps repeating this Pompus "Britain based Uman Rigth Observatory"!! Rami Abdelrahman is the in Britain not in Syria, he's paid by UK and the West to support sectarian extreemists groups, he's a single person who claims to be in the Syrian Opposition "FSA" posing as an entire Human Rigth Organisation. Rami Abderahman is becoming a comical "Watch Dog".